The story began in the year 1979, when Sir Bill Gammell, the former chairman had founded Cairn Energy. In the year 1988, the company was listed on the London Stock Exchange. Sir Bill Gammell became its first Chief Executive and has held this position for more than two decades, overseeing the organisation's transformation to one of the largest independent exploration and production companies in Europe. As the Indian oil and gas market has been deregulated in the early 1990's, Cairn's focus turned to this region and also acquiring Command Petroleum Ltd in the year 1996, an Australian-quoted company with interests in South Asia. Cairn Energy PLC, a FTSE 100 company, was one of the first UK companies to invest in the Indian oil and gas sector. Cairn has been operating in India for more than 15 years and has played an active role in developing the oil and gas resources in the country. Ravva in eastern India was the first offshore oil and gas field to be developed, followed by the Lakshmi gas field in western India, which was discovered in 2000 and commenced production in 2002. In January 2004, Cairn had added the Mangala oil field in Rajasthan to its assets and this, along with the other discoveries in Rajasthan, are expected to form core of the future developments in India.On 9 January 2007, Cairn India Limited was listed on the Bombay Stock Exchange and the National Stock Exchange of India. In FY2011, the holding company of Cairn India Limited, Cairn UK Holdings Limited, along with its holding company, Cairn Energy PLC (Company's ultimate holding company) agreed to sell a substantial part of its shareholding in the Company to Vedanta Resources Plc and Twin Star Holdings Limited (a wholly owned subsidiary of Vedanta Resources Plc). In FY2012, Vedanta Resources Plc. which along with its subsidiaries became the promoter of the Company. Cairn India's strategy was to establish commercial reserves from the strategic positions in high potential exploration it plays in order to create and deliver shareholder value. In the implementation of this particular strategy, Cairn India focuses on material positions that are capable of providing significant growth through exploration. The company operates the largest producing oil field in the Indian private sector and has pioneered the use of cutting-edge technology to extend production life. Today, Cairn India is embedded with world-class resource base, with interests in India, Sri Lanka and South Africa. Harnessing much of the combination of innovation and entrepreneurship, Cairn India has already been one of the most significant oil and gas exploration and production companies in India. It is amongst the top 20 global independent E&P companies. These successes have created a company with more than 1,399 employees and world class oil reserves in one of the fastest-growing economies in the world. Today, Cairn India has operations in the states like Rajasthan, Andhra Pradesh and Gujarat. The company operates the largest producing oil field in the Indian private sector and has pioneered the use of cutting-edge technology to extend production life. Cairn India sells its oil refineries to major refineries across India and its gas to both of the public and private buyers. In Rajasthan, post Government of India (GoI) had the approval for higher Mangala offtake of 150,000 bopd, production from the block here which is currently at 175,000 bopd. A stronger Joint Venture (JV) partnership and also it has the Government of India support which has helped produce and deliver more than 145 million barrels to Indian refiners since commencement of production. Cairn India and its JV partner ONGC have set up the Mangala Processing Terminal in Barmer to process the crude from the Rajasthan fields. A continuously heated and insulated pipeline has been constructed to transport the crude from Barmer to Bhogat in the coast of Gujarat. The pipeline section from Barmer to Salaya is operational and sales have commenced to private refiners and IOC. In Andhra Pradesh from the Ravva field, the average gross production in FY2012 was 36,379 boepd - comprising of an average daily oil production of 27,165 barrels and an average daily gas production of 55 million standard cubic feet (mm scf). The field has produced more than 245 mm bbls of crude and 300 billion cubic feet (bcf) of gas - more than double the initial estimates. This demonstrates how modern technology had played the central role in accessing new reserves and transforming the economic landscape in the region. In Gujarat from the Cambay basin, the average gross production for the year FY2012 was 8,242 boepd - comprising an average daily crude oil production of 5,204 barrels and an average daily gas production of 18 mm scf. CB/OS-2 block in the Cambay basin is an example of optimal asset utilisation. 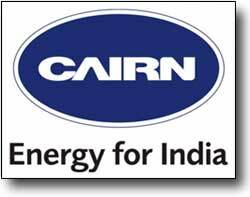 In India, Cairn has made 40 oil and gas discoveries. Three out of the seven landmark discoveries in India in the last decade have been made by Cairn. In January 2004, Cairn discovered the largest onshore oilfield in India since 1985 - the Mangala field in Rajasthan. To date, 25 discoveries have been made in Rajasthan. Working in partnership to provide energy for the future, working with the Government of India, State Governments and the joint venture partners for more than a decade, Cairn India has developed an in-depth understanding of the regulatory environment and, more importantly, has laid the foundations for the strong relationships that are needed to help provide some of the energy needs of one of the fastest-growing nations in the world. Cairn India aims to make a positive impact wherever it operates, not just for Cairn India employees but for their families and the wider community. More than 80% of Cairn India's employees are professionally qualified and are led by a seasoned management team with substantial experience. They have a passion for the business and in a fast-moving environment, they are expected to adapt to change, to use their technical and commercial acumen to manage risk and uncertainty and to make brave decisions in the pursuit of Cairn India's vision. Cairn has maintained a low-cost operating base by focusing on life-cycle planning, continuous monitoring and control of operational costs and the innovative application of operating technologies. Maintaining Cairn India's low operating cost base through efficient operations is critical. Its strategy is to focus on life-cycle planning and continuous monitoring and control of operational costs as well as applying innovative operating concepts and technologies. In the Ravva field, Cairn India and its JV partners completed an infill drilling and work-over campaign at Ravva. This has helped to slow the rate of production decline. The campaign also met its target to increase water injection capacity in the field, which is important from the perspective of reservoir and environmental management. Become a global, world class E&P company, establish a diversified and sustainable portfolio, deliver long term value to host Governments, Local Communities and all stakeholders Cairn India is part of the Vedanta Group, a globally diversified natural resources group with wide ranging interests in aluminium, copper, zinc, lead, silver, iron ore, etc Cairn India is one of the largest private exploration and production companies currently operating in India. Innovative thinking and a "can do" attitude. Demonstrates self-belief and confidence in new areas. Experiments without fear of failure. Provides leadership and drive to meet challenges. Is passionate and outperforms on commitments. Working together towards common objectives. Puts collective goal ahead of individual interest. Asks for and gives help willingly. Listens and respects other's opinion. Committed and accountable for our actions. Responsible for our own and team's actions. Takes personal accountability for delivery. Goes beyond one's role to deliver on commitments. Manages resources of the organisation effectively. Cairn India Limited believes in creating value for its stakeholders and is committed to conducting its business in a sustainable and efficient manner focusing on long term growth by following best practices in its business and operations. The corporate governance philosophy of Cairn India Limited is structured to institutionalise policies and procedures that enhance the efficacy of the Board and inculcate a culture of accountability, transparency and integrity across the Cairn India group as a whole. The Company's policies are in line with the corporate governance requirements under the listing agreements with stock exchanges. Cairn India, to realise the value of the Rajasthan crude, decided to build a crude oil pipeline. Known for many firsts and innovations in the country - Cairn India embarked on a journey of turning vision into reality. Foundations for the Mangala Development Pipeline Project was laid. Grit and passion helped build the World's longest continuously heated and insulated pipeline. It continues to bring laurels to Cairn India. PertroFed, an association representing companies from public and private sector which are operating in Indian oil and gas sector, conferred "Oil & Gas Pipeline Transportation - Company of the Year 2012" award to Cairn India. 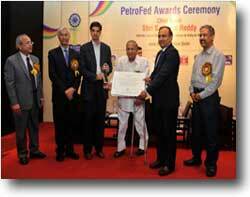 The award was presented by the then Union Minister for Petroleum & Natural Gas S. Jaipal Reddy to Mr. Rahul Dhir. The objective of the PetroFed Oil and Gas Awards is to celebrate the Industry's most outstanding achievements. The federation has institutionalised awards in recognition of contribution made by corporate and individuals in the Indian Oil & Gas industry. It is a platform which is used to recognise and celebrate the leaders, innovators and pioneers in the oil and gas industry. Cairn India was awarded the Blue Dart Global CSR Award for 'Best Corporate Social Responsibility Practice Overall'. The award was presented by the Corporate Affairs Minister M Veerappa Moily at the Global CSR awards in Mumbai on Feb 18th 2012. The Global CSR award aims at assessing the extent of integration of CSR concerns with corporate functioning; responsiveness to the needs of different stakeholders and development of innovative models to fulfill social responsibilities. Cairn India, dedicated to the highest standards of Corporate Social Responsibility, bagged the award for its sustained contribution in India towards community development initiatives across its operations in Rajasthan, Andhra Pradesh and Gujarat, that has impacted lives of thousands of people. Cairn India also won the 2011 Spotlight Awards by League of American Communications Professionals. Cairn India Limited has won the 2011 Spotlight Awards (Platinum category), Global Communications Competition, instituted by the League of American Communications Professionals LLC (LACP). Cairn India's Annual Report was termed "remarkable and outstanding in the light of tremendous competition from more than 1500 submissions across several countries and 400 entities" and received an almost perfect score of 99 out of 100. Platinum Award for excellence on development of the Annual Report. Cairn India takes pride in developing all communication materials including Annual Report in-house. Project of the Year Award 2011. Cairn India's Mangala Development Pipeline Project stood runners up in the "Project of the Year Award" at the Project Management National conference 2011 held on 8 September, 2011 in Bangalore. Cairn India was accorded the 'Superbrand' status on 27 July, 2011. The award was received by Manu Kapoor, Director - Corporate Communication, Affairs & CSR, Cairn India from Planning Commission Deputy Chairman Montek Singh Ahluwalia at a grand ceremony in New Delhi.